What Happens When a Business Objective Opposes User Experience? We’re big advocates for user experience design. There’s no good reason for companies not to involve their users in designing better products. However, there’s sometimes a clash between what a company wants to achieve and what its’ users want. What happens then? It is important to remember that our first priority as UX designers is to serve the business we work for. Yes, the business and not the users come first. Why? It’s because without the business there will be no users to speak of. Our work is supposed to be meaningful because it helps organizations to achieve their objectives. For example; we build a nice shiny new website because we expect it to pay for itself either in sales or in sales leads. No sales and there’s no need for that website. It doesn’t matter how good the UX of the product is – if it isn’t supporting a business objective, it’s not going to be of value to the company that makes it. Some business objectives cannot be railroaded through the users. It is important to recognize that your product may not be able to achieve a specific business objective; not all products meet all business objectives. How Do We Handle a Clash? 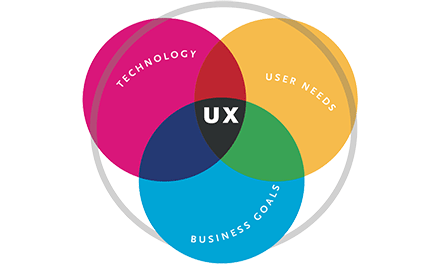 It really comes down to being clear about the user experience and business objectives as early as possible. Before conducting user research you should know what the company expects from its investment in a new product – what are its’ objectives. Then during research you want to see if there are any areas of potential conflict. For example, I might be happy to use your new social network but I might be a lot less happy if my use of the network was to grant you copyright to any of my creations that I share on that network. I can understand why that might benefit your business but I have no idea why it would benefit me. Once you have these areas of conflict you can determine if any of them are a deal breaker for either the business or the user. If they are – you can start to look at alternative approaches that work better for both sides. Part of conducting great UX design is understanding that you can create awesome user experiences that also meet business objectives. Apple does just that and it may be why the analysts are suggesting it will be the first ever trillion dollar company.